I didn’t feel its heart beat through the thickness of my scarf, but it would have been many times mine. The smaller the animal the faster the heart. This bird was canary sized, and their heart beats an incredible 1000 times a minute. Compare that to the sluggish human heart, with a resting rate ranging from 60-100 beats per minute. Mine runs even slower than normal – and my 40th year I had a full health check and the doctor was concerned to measure it at 50 beats per minute. I was clearly not an Olympic level athlete, who’s well trained hearts push more blood per beat. However I was not worried as I recalled how my brother played with his slow heart rate, finding his doctor’s reaction amusing, after he had sat in the waiting room, intensely relaxing and slowing his breathing and heart. The doctor had told him he should be dead. So my 50 beats sounded lively enough to me. Still, I was sent to a cardiologist “just in case” – no problem detected. In fact it was probably a good thing. And Real Vedic teachings concur: according to Vedic information, life span is measured in heart beats. One has an allotted number of heart beats in any one particular life time, and when they are spent, the body dies. Some yogis can slow their heart rates to barely perceptible levels and sit in meditation in mountain caves for incredible periods of time, apparently ageless. So a slower heart rate may extend your life. (And indeed some western scientists are researching this currently.) There is no need to fear exercise driven speeding up your heart, however, like a factual Anse Bundren, the character in Faulkner’s As I Lay Dying, who wouldn’t work because he thought he’d die if he sweated. As the cardiologist told me, my low heart rate could in part be because of athletic activities during my past life (I refer to the past of this particular life… his expertise didn’t give him insight into my previous incarnations!). Regular aerobic exercise, while raising your heart rate temporarily can lead to a lower heart rate over all. When one considers how one’s time is limited, whether one thinks in terms of heart beats, hours, days or years, one begins to appreciate that our time in this body is limited. And a limited resource is a valuable one. A million dollars cannot give you back one moment of time. Why does this matter? After all, once we realise that we are not this body, that we are eternal living entities who exist both before the birth of this body, and after the death of it, why should we be concerned about time… we have eternity? This is a fair question. But do we want to spend that eternity moving from body to body, suffering birth, disease, old age and death, sometimes in the body of a cockroach, sometimes in the body of a cat, sometimes in the body of bird, with no shelter when the cat has seen its canary yellow and pounced? Or do we want to use the time we have in this amazing human form, where we have the intellectual capacity to consider these issues, and the ability to use our understanding to advance spiritually to the point where we can leave the cycle of birth and death altogether and be re-situated in that realm where our eternity is fully expressed, timeless, deathless, without suffering and pain, and suffused with love and joy? All these point to the most difficult questions relating to spirituality. In regard to this, the answers to the above confusion is explained in a very simple and detailed manner, you can explore the real facts and more about ancient yoga wisdom given in the website of Jagad Guru. The yogic teaching is that one should take this human form and use our time while here, to engage in devotional activities, activities that reawaken our unmotivated love for the Supreme and for all living entities, until we come to the point that that love overcomes our lust for things of this world. At that point we are no longer of the world, even if we are within it. There are so many activities we engage in that are really basically capricious, with no real purpose or focus that changes at the whim of the desires of our body and mind. If one is interested in moving forward spiritually it is good to be aware in our activities. Are we using our time wisely? Are we ensuring we spend some time each day in activities which will bring us closer to God? We have duties to our family and society, we have duties related to the health of our body and mind, and these things are not capricious. But if we are honest we will almost certainly find that many of our activities are chasing will-o’the-wisps, which we never catch, running first left, then back, then right and left again. There is much literature written in today’s busy world about time management, and a major theme is the idea of trimming down what one does in order to achieve what one really wants. This is exactly what I am talking about. The additional requirement, above and beyond what is found in these writings, is a discussion on what one should really aim for, in order to achieve happiness. There is an assumption, despite the common discussion on the need for you the reader, to define what success means to you, that success is something to be found in the material world, be it money, weight loss, temporary material relationships, travel, or, the overriding theme in many of these books, career success. The Vedic teaching is that real success is only found in the eternal realm, and is the achievement, or reawakening, of the natural loving relationship between soul and Supreme Soul, and thus also, between soul and soul, as we realize our kinship as children of the One Supreme. In fact the material “successes” implicit in most time management manuals are all based on our natural need for love… career success implies approval and respect, and money, which provides for those we love, or at least buys some semblance of love and acceptance. But back to the bird I rescued… it did not have the capacity to understand such things, however I gave it “food for thought” in the form of transcendental sacred mantras, which set even those souls in the bodies of animals, (and birds!, and even plants, though you have to shout loudly for them to hear in their sleepy stupor), on the path of liberation. As far as the bird’s material well-being, we tried to feed it bird seed, nectar bearing flowers, fruit… no interest. Two of my friends who had a spare traveling cage came round, and between us we found out that many vets treat native birds for free. They took the bird to the vet, who explained its lack of interest in our offerings. 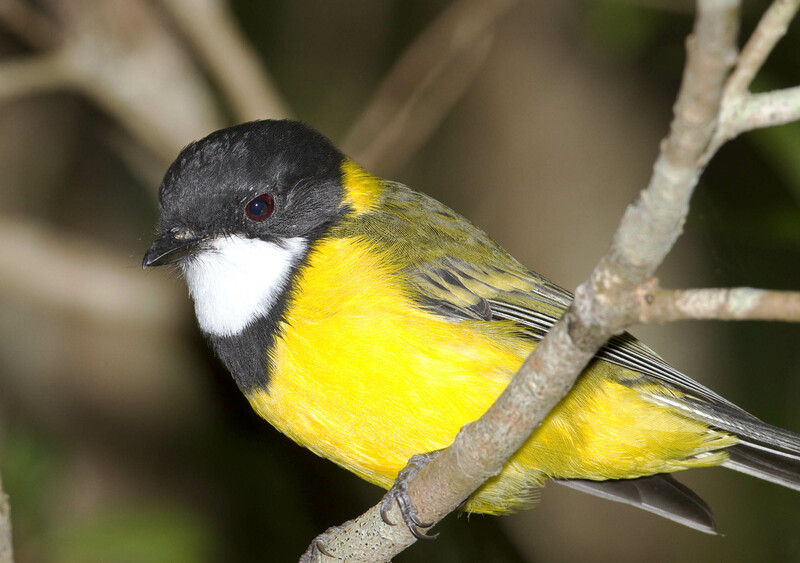 It was Golden Whistler and ate mainly insects. It was not hurt, just seemed to be in shock. It is not usually found in the suburbs, liking rain-forest and wooded areas, and sometimes visiting parks. We wondered if it had found shelter, in the wheel rim of a car, and been trapped inside when the car was driven off. Whatever happened, it had survived, with no broken limbs, but in a state of shock and that was how I found it. After being monitored overnight at the vets it was taken to a bird shelter and later released back to the wild. And if we are so lucky, we are likewise rescued and taken back our natural habitat, the realm of the Supreme Person, and the abode of eternal love. If some kind soul picks us up and gives us transcendental food, transcendental mantras, we must not peck at their hand, and try and escape from their help, out of misguided fear, but accept their offering of love and assistance, their help in being returned to our eternal home.